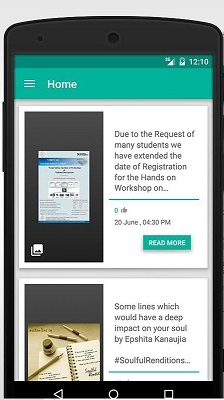 NSIT Connect is the official NSITOnline app that aims to act as a companion app for the students of NSIT. The app contains several useful modules that enable students to stay up-to-date with all the college news, maintain a schedule according to their timetable, find out all about interesting places in and around college, and more. But this project is a lot more than an app. This is an initiative that is targetted at all the emerging developers of NSIT and encourages them to take part in this as a collaborative open-source team effort. So if you are an NSITian and you love developing things and wish to see them used by a large number of people, you have come to the right place. The home page is the news feed of the NSITOnline official page. All the latest news are pulled and shown in an aesthetic UI. You can go through the description and browse/download photos of the posts in the news feed. The My Feed section allows you to create your own personalized news feed by following only the specific groups or societies you want to hear from. Junoon Photography Club's YouTube channel is the source of all entertainment going on in the college. No one wants to miss out on them, so this section gets you the latest uploads and also allows you to view them right there in the app. The Calendar helps you in tracking your attendance on a regular basis by recording your dates attended and missed (input by the user). It can also fetch your timetable from our server and give you advice about how many classes you need to attend to make up for short attendance or how many you can miss if you have more than enough attendance. Locations help you to get around the whole college by providing you with all hotspots that NSITians frequent. You can think of it as a Bible of all the places in NSIT and not only that, you can visit that location in a map and also check how far you are and how much time it will take you to reach there. Fork this project into your own repo. Make your changes to that repo, and create a pull request. That's all there is to be a contributor of NSIT App v2. We are looking forward to working together with lots of aspiring developers and to maintain this project by collaborating with the open community. To know about the APIs used in the project and for other project-related documentation, please refer to our wiki page. This project is founded and actively maintained by Sidharth Patro and Swati Garg. For any sort of queries feel free to either mail at sidharth.patro@outlook.com or swati4star@gmail.com. We will certainly reply to you as soon as we can.